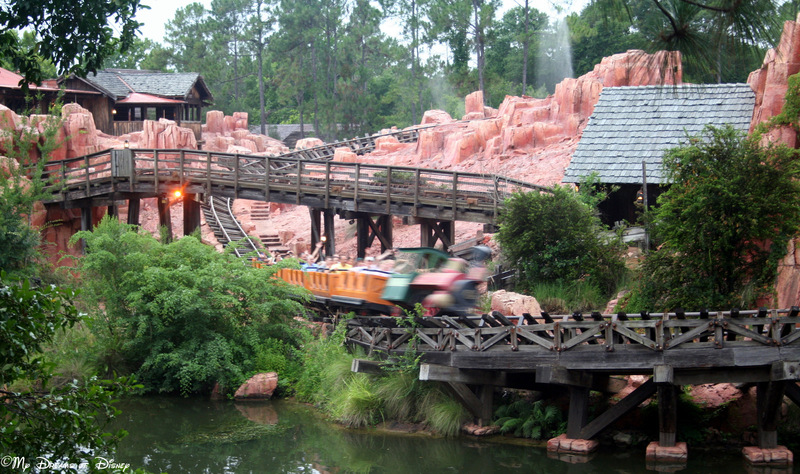 One of our favorite roller coasters in all of Walt Disney World is Big Thunder Mountain Railroad! Opened on November 15, 1980 at the Magic Kingdom’s Frontierland area, this roller coaster is a wild west rootin’ tootin’ good time! In fact, this was the first roller coaster at Walt Disney World that I ever remember riding, way back when I was a kid. What I like about the attraction is the way it incorporates such a great backstory into the attraction. It almost makes you think that this isn’t just a ride, it’s actually a true story! The story goes that in the late 1800s gold was discovered on Big Thunder Mountain, and the tiny town of Tumbleweed was formed out of folks looking to strike it big. Since business was good, a mine train was installed to take people up the mountain — but what no one knew was that the site was actually the location for a Native American burial mound, and was cursed! In response to desecrating the burial mound, the town of Tumbleweed was flooded, and the town quickly became a ghost town. Later on, though, it was discovered that the mine cars were actually moving on the tracks on their own without any human interaction, and the Big Thunder Mountain Railroad was formed to provide train rides as entertainment. Imagineer Tony Baxter and ride engineer Bill Watkins were the designers for Big Thunder Mountain Railroad, and it is to them that we owe a debt of thanks! Big Thunder Mountain Railroad was also one of the first Disney rides to utilize computer-aided design! Big Thunder Mountain Railroad has a lot of interesting features. If you happen to ride the train at night, as you enter Tumbleweed and approach the saloon, look to the second floor windows — you’ll see the lights are on and girls are dancing in the windows! Also, there is at least one Hidden Mickey in the attraction. Do you know where it is? I really enjoy Big Thunder Mountain Railroad — do you? Let me know in the comments, and thanks for stopping by!